We have recently deviated from the usual diet of fisheries-related themes, but our recent report on fracking received more momentum than expected. In return, we gained the attention of a licensed geologist. Here we share his forward projections about the fracking issue. Like any type of resource extraction, fracking has costs and benefits. Often the negative aspects are publicized and provide a bleak and threatening picture of a fracked landscape. The jury is still out on the ultimate costs and benefits of fracking, but several conditions need to be met before fracking will even take place. It turns out that natural gas deposits are not all created equally, each presenting a different list of considerations as fracking activities begin. Below, I briefly describe the unique geological conditions of fracking, using examples in North Carolina. 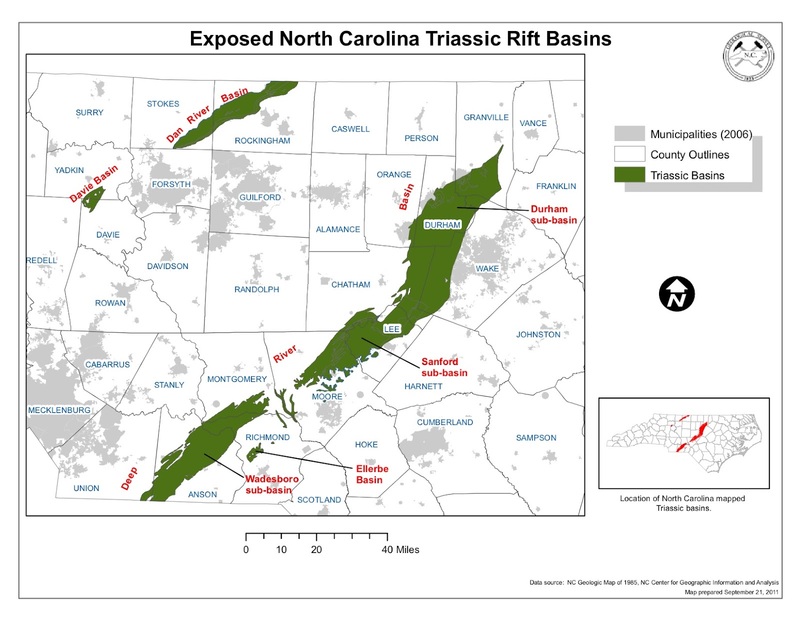 GEOLOGY: The target layer for fracking in North Carolina is a black shale that lies within what is known as the Triassic Basin—methane deposits across the US are most frequently found in shale layers. In NC, the shale layer is shallow and completely exposed near Durham, then dips to depths less than 3,000 ft towards the southwest. Compare this to the Marcellus Shale in Pennsylvania, which is over 1-mile deep (>5,280 ft). Although shallower deposits do make it easier to frack, NC deposits are very close to aquifers and will likely solicit concern from residents (in contrast to PA, where the shale is much deeper than groundwater aquifers, but negative fracking–aquifer interactions still occur). Upshot: Shallow shale beds are tempting to frack, but negative surface interactions present a serious challenge. 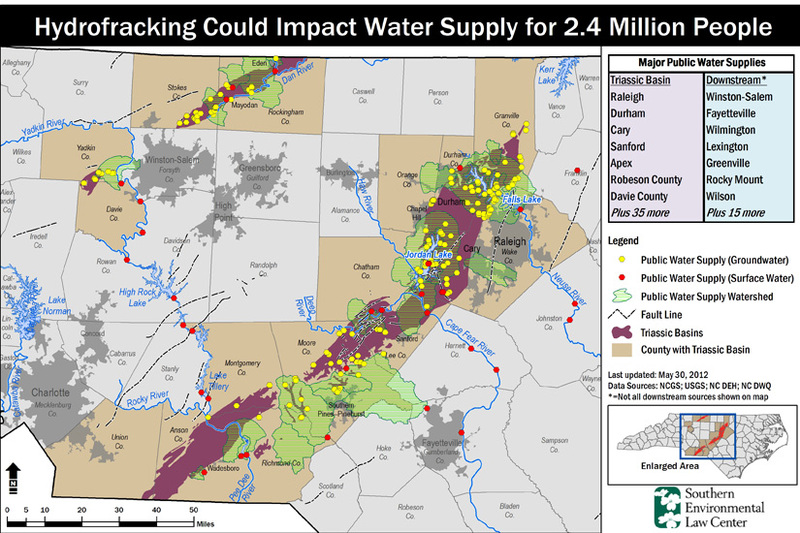 HYDROGEOLOGY: Central North Carolina groundwater aquifers are located within fractured bedrock at depths ranging from several hundred to a thousand feet below the Earth surface, reaching deeper than in other fracking regions like Pennsylvania. Therefore, there is only a thin interval between the shallow Triassic Basin shale formation and potable water aquifers in North Carolina. This is certainly important to consider because of the potential for upward migration of methane and by-products into potable groundwater supplies through naturally occurring dikes and faults that may interact and connect with artificially created hydraulic fractures. With groundwater providing 42 percent of North Carolinians with drinking water, while also providing the majority of water supply for livestock and crop irrigation, a large impact is expected with the higher potential for groundwater contamination in North Carolina. Upshot: Shale layers close in depth and interconnected by geologic pathways to groundwater aquifers are difficult to frack safely under current methods. WATER AVAILABILITY: With current technology, a fracking well needs 5­–6 million gallons of freshwater to frack a well over one cycle. Each well can be fracked 7–8 times before exhausting the available methane. This means that up to 50 million gallons of freshwater are needed per well, representing the average daily water use of 83,000 people (e.g., the population of Asheville, NC). At its peak, the fracking industry is projected to use up to 68 million gallons per day of freshwater in North Carolina (NCDENR final fracking report 2012, page 77), or the average daily use for over one million people (e.g., the populations of Charlotte, Wilmington, and Asheville, combined!). Upshot: Limited freshwater supplies would experience difficulty consistently supporting this high of a demand. LAND USE: In North Carolina, owners of the land surface have ownership of minerals under their land—this is often not the case in oil patch states like Texas and fracked lands in Pennsylvania. Due to the horizontal nature of frack wells (often running a mile or more outwards), companies need huge parcels of land to operate one well. For instance, there doesn’t exist a single private parcel of land that is large enough for one well in more urban Wake County (1.67 acres/parcel average); however, larger intact parcels exist in more rural Lee (5.28 acres/parcel) and Chatham (10.92 acres/parcel) Counties, where a majority of fracking is expected to take place, and four gas extraction companies have already leased more than 9,000 acres in Lee county alone. Further, many landowners in this region already sold off their mineral rights to extraction companies back in the Great Depression to help pay property taxes during tough times. Upshot: Fracking would require a high number of landowner agreements on adjacent parcels in regions where parcels are small and land owners own mineral rights. ECONOMIC FORECAST: With a glut in natural gas caused by a huge reserve, methane prices are currently low. Plus, fracking infrastructure is non-existent in North Carolina and companies would have to invest a lot of capital on the front end in pipelines and storage to get up and running. Add a relatively small gas play for the Triassic Basin in North Carolina compared to larger, more established and potentially less regulated plays in Pennsylvania, and questions surround the ultimate payout of North Carolina frack wells. Upshot: Fracking in areas with smaller deposits does not currently represent the economic windfall that it does in other regions. Fracking faces many challenges in exploring new frontiers. Of course, that’s not to say some won’t try. Don’t forget to check out our recent report on fracking. Previous Post Where is Captain Planet when you need him? Next Post What Do Las Vegas and Coral Reefs Have in Common? Thanks Simon for an easy to read/understand synopsis. 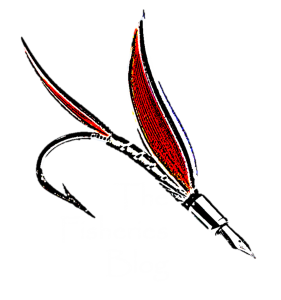 Thanks for contributing to the Fisheries Blog, Simon. An excellent and objective take on the unique issues of fracking in North Carolina.